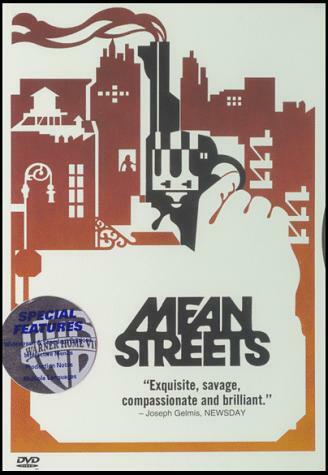 Mean Streets is the film that launched the career of one of the finest American filmmakers of his generation: Martin Scorsese. After making the interesting Who's That Knocking at My Door? (1968) and working for Roger Corman on Boxcar Bertha (1972), Scorsese exploded onto the scene with this remarkably assured low budgeter about the lives of some small-time hoods in New York's Little Italy. Shot on location in New York and Los Angeles—with the same crew used on Boxcar Bertha—Mean Streets comes vividly to life. The film centers on the struggles of four residents of Little Italy, all men in their mid-20s who aspire to be gangsters, loan sharks or just plain hoods. There is Tony (David Proval), the big friendly one who runs the neighborhood bar; Michael (Richard Romanus), a small-time loan shark who likes to rip off naive teenagers from Brooklyn; Johnny Boy (Robert De Niro), a crazy, irresponsible hood, who has a penchant for blowing up mail boxes and borrowing money from loan sharks he never intends to pay back; and Charlie (Harvey Keitel), the well-dressed nephew of the local mafia boss Giovanni (Cesare Danova), who wants nothing more than to run his own restaurant. Charlie is torn between the life of the streets (and trying to keep Johnny Boy out of trouble) and the life his uncle can give him. He is also deeply religious, patterning himself after St. Francis of Assisi—testing his faith and seeking penitence for his sins on the streets. The testing of this faith takes the form of Johnny Boy and his sister Teresa (Amy Robinson). Charlie's uncle doesn't want Charlie to keep company with either of these people—Johnny Boy because he seems to be so unstable, and Teresa because she is an epileptic. Charlie is determined to "save" Johnny Boy and sees this challenge as a way to bring his two worlds together and achieve sainthood. But Johnny Boy seems to be a lost cause. Constantly late for his weekly payments and disrespectful to everyone but the ladies, he gets Charlie deeper and deeper into trouble. Charlie's secret relationship with Teresa also threatens to ruin his plans. Life continues in its normal fashion (fights at pool-halls, card games, taking in a movie and the celebration of The Feast of Gennaro) until Johnny Boy pushes his luck to the limits and causes the film to charge to a violent conclusion. With this film, Martin Scorsese first gave evidence that he was a master of the medium. It is a terrifically well-made film, sharply photographed, and crisply edited, with the usual assured visual flair Scorsese puts into all of his films. Keitel is brilliant as Charlie, combining the street-smarts of a local boy with the higher aspirations of a saint. His conflict of faith is so strongly and assuredly brought to the screen that this is easily the most religious of all of Scorsese's work (including The Last Temptation of Christ, 1988), and provides an interesting and provocative subtext which is fully explored. Charlie is not unlike Dafoe's Christ of The Last Temptation. He, too, is tempted by the flesh and by the warped values of humanity, and must find a way to appease himself and his God. Charlie's own philosophy—which is that you pay for your sins on the street, not in church—is tested to the limits when he takes on the challenge of Johnny Boy. De Niro, with the more flamboyant role, is simply astounding, and his scenes with Keitel (most of which were improvised or developed through improvisation) are absolutely brilliant, ringing of complete truth and natural progression. The supporting cast is also impressive with Romanus and Danova being particularly strong, and, in smaller roles, Northrup (as a disturbed Vietnam vet) and Memmoli (as the owner of a pool hall) are outstanding. Wonderful moments Some of the stand-out moments include an extended fight scene in a pool hall (the fight starts amusingly enough, over someone being called a "mook"—the guys aren't quite sure what it means, but they fight anyway), in which Scorsese uses long takes to emphasize the chaos, and employs a wild tracking shot to follow a pair fighting throughout the room. Another creative moment comes when Charlie gets drunk at a party. By attaching a swinging camera to Keitel and using a wide-angle lens, Scorsese almost perfectly recreates the feeling of intoxication. All of this flashy style never interferes with the characters or detracts from the story, which remains powerful, funny and ultimately tragic. There are enough wonderfully inspired moments to fill a year's worth of films. Mean Streets is worth seeing simply for those moments. Particularly fine are the scenes that show Northrup's breakdown at his coming home party; the guys at a movie theatre watching The Searchers (1956) -- a film whose influence on Scorsese can be found throught his films; Johnny Boy shooting a gun from a roof; or the striking moment when Teresa has a seizure and Charlie chooses to chase after Johnny instead of staying with his girlfriend (he leaves her in the care of an elderly woman played by Scorsese's mother). The hilarious scene in which Charlie and Johnny Boy argue about Johnny Boy's debts in the backroom of a bar (a scene that was improvised) is alone worth the price of admission. The banter is genuine, the atmosphere thickly realistic, and the people alive (Scorsese did, after all, grow up on Canal Street).